Kaori Sushi & Sake Bar serves sushi in San Mateo. Blanched seasoned spicy soy beans. Mix green and chef's dressing. 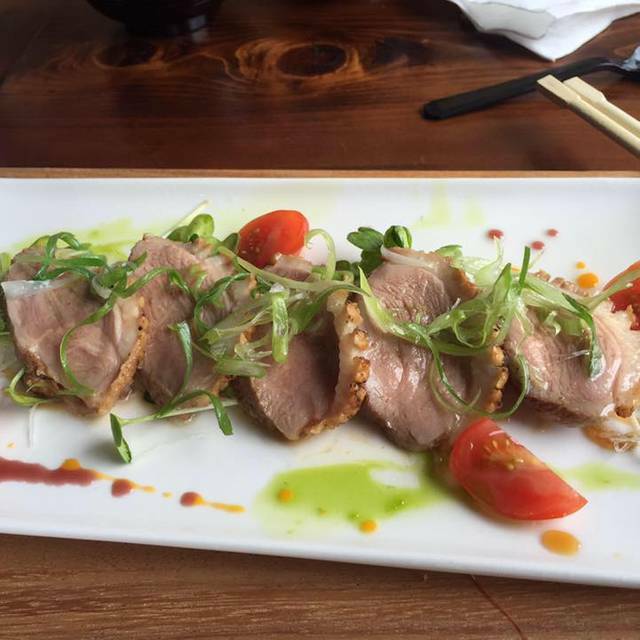 Hawaiian style marinated tuna and vegetable with light spicy ponzu. Hawaiian style marinated salmon with light yuzu sauce. Grilled Japanese black pork sausage. Grilled whole squid served with ginger soy sauce. Lightly fried crispy squid legs. Visited on Sat 13Apr dinner. Small setting. I was alone and restaurant was not packed yet waitress led me to sit in a table for two squeezed between two other tables that are occupied. I decided to sit by the bar counter. Seriously? Since you are not full, at least let your customer sit comfortably. Food wise, salmon sashimi was thick and fresh but 7 pcs for $19.95 without option on pcs, I didn’t finish all. Soba with shrimp tempura was good, tempura was not oily. Waitress was very friendly and ambience was nice so except for flexibility in seating, everything is great. Will return and hopefully they will not squeeze me between two tables again. Oh, parking a challenge, I will forgo booking if I can’t find a lot. No free wifi too. Great restaurant! Everything is to the point, high quality products, great service. I love this place. Food is always decent. Service was great. I will definitely be back. Food is amazing but always feel a but rushed even when we've made a reservation. Staff is nice just very hurried. 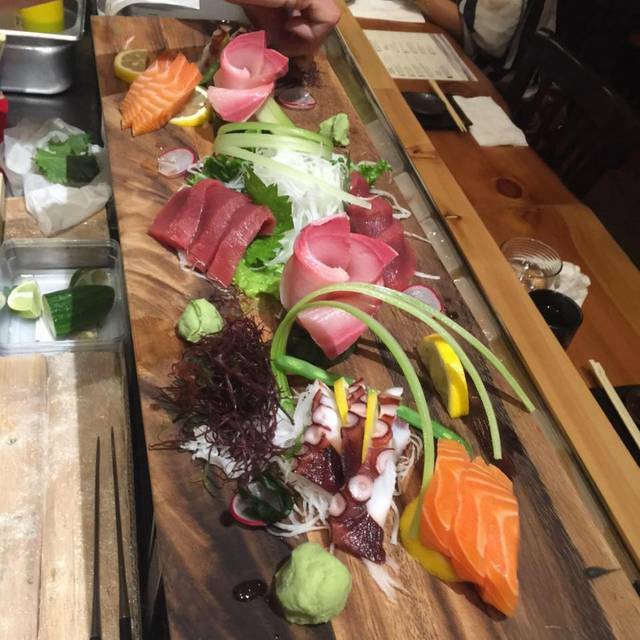 But food makes up for it - melt in your mouth sashimi. Great selection, really fresh and tasty! Nice quiet place off the beaten path. We'll go back for sure. Excellent service, fresh food prepared well. Delicious Gyoza, mackerel, udon, sashimi. We must try the rest of menu. Good selection of beers and sake. Over booked the reservations. It took another 30mins plus from our original reservation. 7:30pm reservation, got our table at 8:10pm. Sat for another 10mins before someone took our order. Forgot 1 of our appetizers order & came out with a different appetizer order. We are almost done with our meal when the last appetizer came! Delicious and great consistency. Great value for the price. 8:00 on Friday, walked right in. Fast friendly service, excellent amazingly fresh sushi. We’ve been several times, and it’s always like this. Excellent quality. One of only 3 sushi restaurants I've ever been to that serves Kama. That's a big deal. It means they are buying whole fish and butchering in house. If you've never tried it you owe it to yourself to order it. Everything was excellent quality. I'll definitely be back! 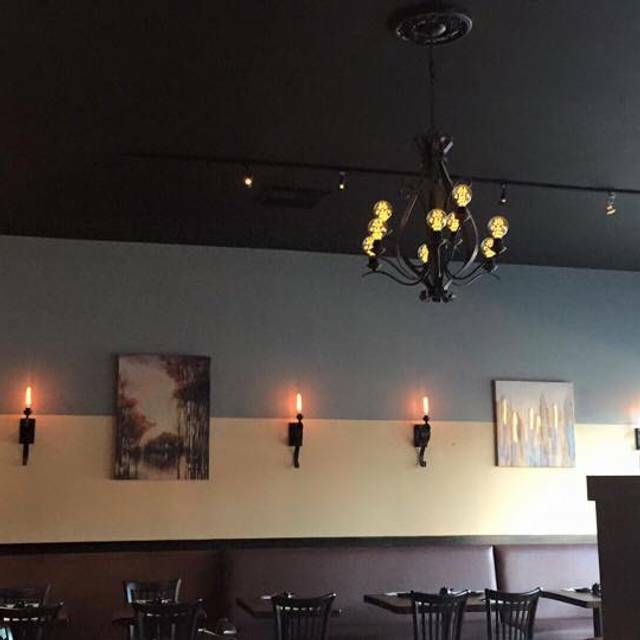 This is a great little spot in a fairly restaurant-populated area. Our server was great, recommending foods. He was very friendly and personable. I much enjoyed the Spicy Seafood-Don dish. I’ll definitely visit again. Great sushi but overall overpriced for our group of 8. Yes we had some sake and wine but it was almost $500 for the 8 of us and that included 3 kids! I used to love this restaurant, but their food quality seems to have declined the last few times we've tried it. It's not that it's bad--it's just that it doesn't stand out anymore from among the many other Japanese restaurants in San Mateo. Always great, fresh food and sushi. Fast and prompt service! Favorite Japanese Restaurant in town! Nice place with strictly a Japanese leaning on beer and alcohol (except for wine). We enjoyed the rolls but my daughter, whose love for shushing, thought one of the dishes was a bit dry. We ordered 5 different sushi entrees. The children’s chicken dish was a bit overdone as well. Really enjoyed our meal. Rolls were tasty and generous. Excellent Sushi place. Very creative plates. Amazing taste. Highly recommend if you are in the area. Kaori may just become our new favorite restaurant! I had the chicken udon - it was hot and delicious. Also loved the dragon rolls and my husband loved his chicken teriyaki. Great service, good prices and delicious! Soooooo good and so fresh !!! I have a new favorite sushi place. Fantastic, friendly service, and amazing food. This place has dropped significantly in quality of food and service over the last 6 months. It’s quite audacious to charge $60 for Omikase nigiri when the sushi isn’t fresh. The uni smelled like pooh. The presentation was lacking and the service was horrible. Great food. I went back the next day for lunch to have more ribs. Very clean and fantastic service. Loved the food but the portions are quite small compared to other Japanese restaurants. The food here is delicious!! We had the Agedashi tofu, takoyaki, three sushi rolls, and the sashimi. Everything was worth the price. The only downside here is the wait despite having a reservation booked through Open Table. There was no hostess to greet and it seems they have overbooked. This is a popular spot. So our 630 pm reservation became a 645 almost 650 pm seating. Poor service this night...and, our stomachs didn’t feel to good shortly after. No complaints, very fresh fish, which is great!!! This is a belated review but it's still fresh in my mind. 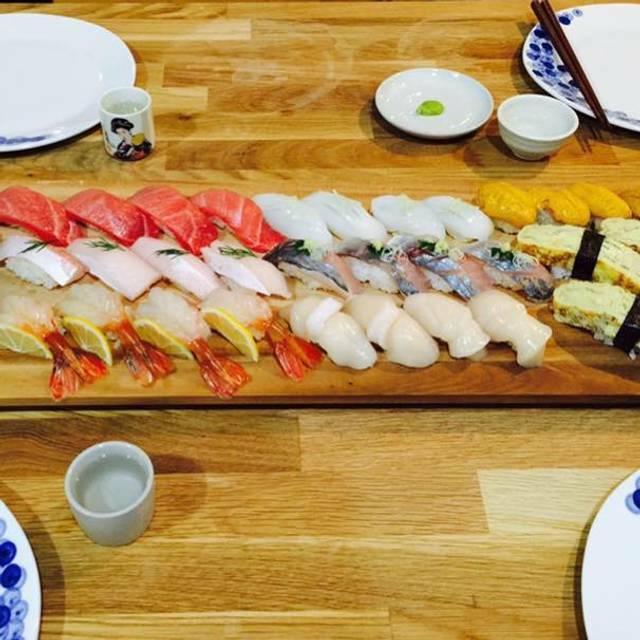 We were very happy with Kaori Sushi as their food are really fresh and tasty. We ordered several sushi dishes, salmon collars, chicken karaage and udon. There were 8 of us for a birthday dinner. Since we made reservation, we were seated quickly. My niece loves chicken karaage so we had two orders. They were tender on the inside and crispy on the outside so we finished them quickly. The salmon collars were meaty and flavorful and the sushi dishes were fresh. Waiters were very attentive. Since we informed them that it's for birthday, they gave us a candle lighted special dessert. We definitely would come back again. 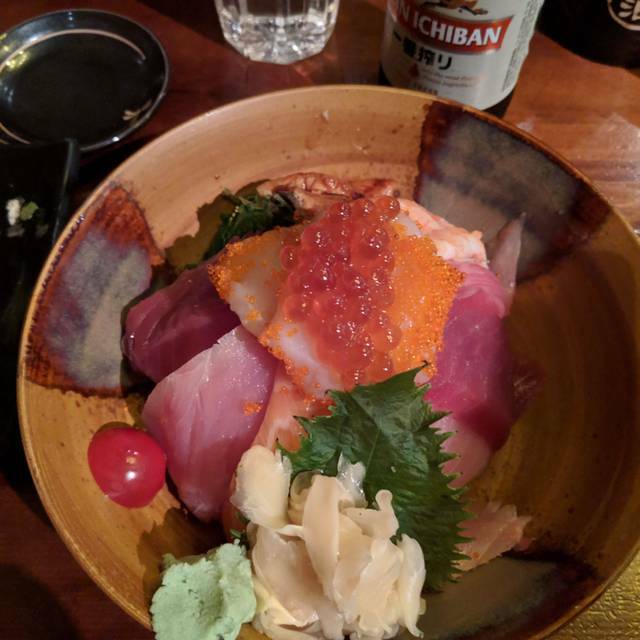 Sashimi was not as fresh as expected. Salmon Teriyaki was excellent as was the spicy garlic edamame. They do not have brown rice and the wait staff seemed a bit put out when you asked for something like water when yours was empty. I've been to Kaori for lunch a number of times and thought that the food and service were good. However, the dinner service on Monday -Labor day was subpar. The servers seemed irritated and was very slow. The restaurant was full but not really busy. We asked the server a few times for a water refill before we actually got it and she was visibly annoyed. The sushi came with a tiny pinch of wasabi and maybe 2 slivers of ginger and when I asked for more ginger, she brought us wasabi and when we repeat our request, she respond with a curt, " I got it for you." Anyhow, we got our bill and there was a line item charge of $2 for the additional ginger. SERIOUSLY? My guests and I had to laugh. What a cheap ploy to beef up the bill. Unorganized, didn't get our table because they claim that Opentable made a mistake because they are booked. We are also returning customers and their service is mostly sub-par. I come to this restaurant at least once a month. Brought a group here when my cousin was visiting from out of town and was somewhat disappointed with the service. We were the only ones there, and got there with plenty of time before closing. They rushed us through our meal and even turned the lights off before we left. Won't be coming back for awhile. Great food. Get the octopus with wasabi, and try one of the spicy rolls. Service was as expected, nothing out of the world, but met our needs. The service staff was attentive and friendly, the fish was fresh and delicious and the price was reasonable. I will return to this place.